Judging by her expression, the woman on the front cover has just clocked the cosplayer on the back cover. Ah, a lost treasure from Picasso’s Blue Period. She is reacting as if she has never seen a moon before. OK, I give. What’s an “Arc Spy”? @Raoul – Don’t you hate it when people don’t read the whole book we’re making fun of before posting a comment. 1. The little blue alien is trying to cop a feel. 2. Do we really need to know Fredric Brown’s home address? 2. Tired of being heckled as a clownish buffoon, Rudi Giuliani decides to upgrade his appearance. How did cosplay get from that nerd to this? The other front cover is much better, although the giant lady’s expression certainly conveys “mad” perfectly. This one’s 90% that one shade of blue. At least they only used one font. This being a satire, I dunno if it fits within the strict rules (koff koff) of GSS. And I love the back cover! Excellent period cosplay, and kudos to the publisher for putting it there. 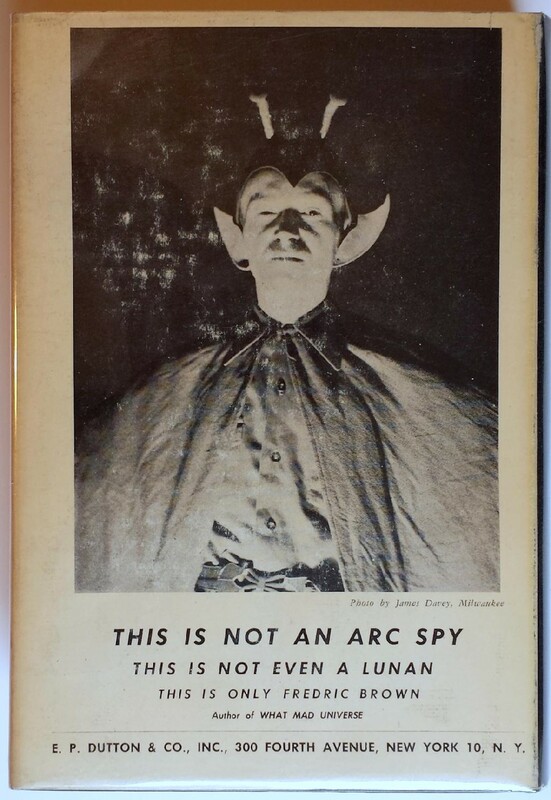 I’m guessing Arc spies and Lunans are in the book; haven’t read it in decades. Sure beats most author photos, with hands on chins looking Deep or gazing off into the distance looking Profound. Combine the other front cover with this back one and it’s perfect. @B’mancer: Nuh-uh, I ain’t clicking your link in (2). I’m still trying to brain-bleach that out, and have thanked my lucky stars I haven’t run into him at a con. @BC (9): GSS on both. @JP (10): Advances in fabric and other materials, including LEDs. Seriously. You can buy stuff off the shelf now that would have taken both a structural engineer and an expert tailor just a few decades ago, and many things that were simply impossible as they hadn’t been invented. I’ve read the book, it’s a hilarious satire of pulpy space-opera. @ARY: Which explains Fred’s get-up on the back cover. Which also serves as an eye chart. 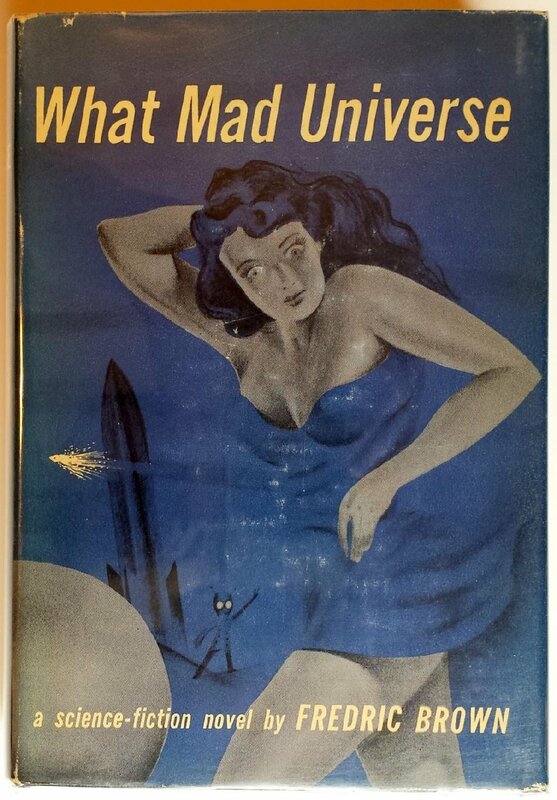 If you can read “author of What Mad Universe”, you don’t need glasses. If you think Fred’s an actual alien, you need glasses and a shrink.